We have explained to countless journalists that our study of the lion Cecil and his companions is set in a much wider context that spans several countries, but because media reports are so skimpy they seldom paint adequately this larger picture. So, here is a brief introduction (and this is the framework for the lion conservation work we will be developing with the generous donations given following the death of Cecil). Nature and natural processes are all joined up. Lions live in prides, and these prides make up a population, and that population is spread through a landscape. Things that happen in one part of the landscape can have consequences throughout the whole population, so it makes good management sense to plan conservation for the entire population throughout the landscape it inhabits. In the case of Cecil’s pride, it lived towards the east of Hwange, partly within the National Park and partly beyond its borders. We have been studying that pride as part of a population that extends beyond Hwange, and indeed beyond Zimbabwe, into Botswana, Zambia and beyond. The whole area is called the KAZA area, which stands for the Kazungula-Zambezi Transfrontier Conservation Area (KAZA –TFCA). The KAZA TFCA spans parts of 5 African countries and covering 287 000 km2 (the size of Italy), and was signed into law by the heads of state of Angola, Botswana, Zambia, Zimbabwe and Namibia on 18 August 2011 (Figure 1). So, we have been engaged in it since the start. Before telling you about our landscape for lions work in the KAZA TFCA, first, some background biology: one of the major challenges to conserving wide-ranging carnivore species is the need to protect extensive areas of habitat to maintain populations of sufficient size and genetic integrity. There is an urgent need to safeguard habitat and wildlife corridors before human encroachment makes such measures impossible. Large carnivores, such as lions, are wide-ranging and are dependent on the availability of natural prey to survive. This makes conservation of this species particularly challenging, especially on the edges of protected areas where they come into conflict with people over space and livestock. Conservation of large carnivores hinges on protection of extensive areas of habitat either by protecting large intact areas or by connecting smaller areas with “safe passage” through habitat corridors. Large, outbred populations are less vulnerable than small populations to being lost through events such as disease or the impacts of people (e.g. retaliatory killing by pastoralists). The genetic health of populations can be maintained only if a threshold number of breeding units (prides) and opportunities for dispersal are maintained. For example, a rule of thumb is that a viable out-bred population of lions requires a continuous population of at least 50 prides (preferably 100) with no limits to dispersal. In most small parks, and indeed even many extensive protected areas (particularly those situated in arid areas), numbers of prides fall below this threshold and therefore over the long term rely on immigration to remain viable. In the KAZA area we have undertaken spoor (footprint) and camera-trapping surveys of lions (and other wildlife) throughout Hwange, in other parts of Zimbabwe (under the authority of the Zimbabwe National Parks Authority), and, in Botswana (under the authority of the Botswana Department of Wildlife and National Parks). In Botswana, as in Zimbabwe, fieldwork funded by the generous support of the Robertson Foundation, we have been GPS radio-collaring lions in key population sources – Andy Loveridge (who is Kaplan Research Fellow at Lady Margaret Hall in Oxford) and David Macdonald have been directing this landscape work since 2013, but until now, we haven’t had the funds to replicate our Zimbabwean community based Long Shield livestock protection programme (where latterly it has been supported by Panthera and Satib) to Botswana, but with the donations in memory of Cecil we are already putting this work in place. But how should we plan the conservation of lions, and other wildlife, in the KAZA TFCA? It’s a huge area, and even with your support we haven’t the funds or manpower to do fieldwork everywhere. 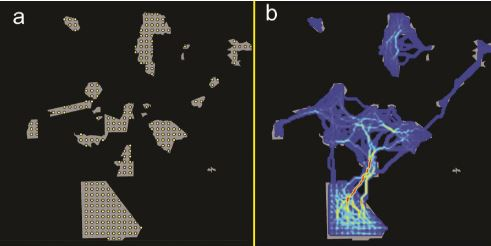 One solution is to use our hard-won data on lions in the wild (those hundreds of thousands of “fixes” we’ve gathered since 1999) to create “virtual lions” in a simulated computer landscape. For those less familiar with conservation biology, let us explain that a really powerful technique for gazing into the future is computer modelling – creating a virtual world to predict what will happen next in the real world – a crystal ball which really works (and gives the conservation planner a chance to make, and remedy, mistakes on the computer screen before meddling with reality). 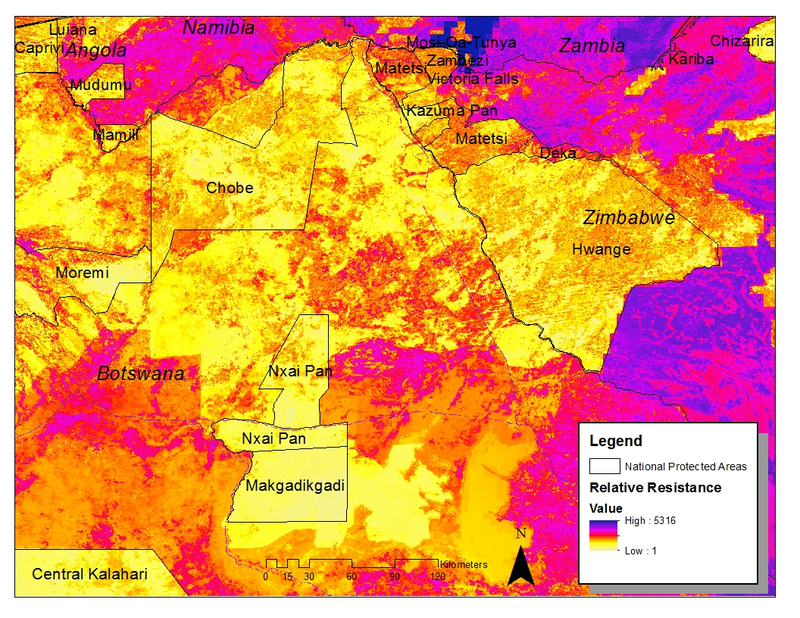 So, we have made a “resistance landscape” model for KAZA, developed over the last four years with WildCRU team members Nic Elliot and Sam Cushman. Figure 1: Map of the Kazungula-Zambezi (KAZA) transfrontier conservation area. 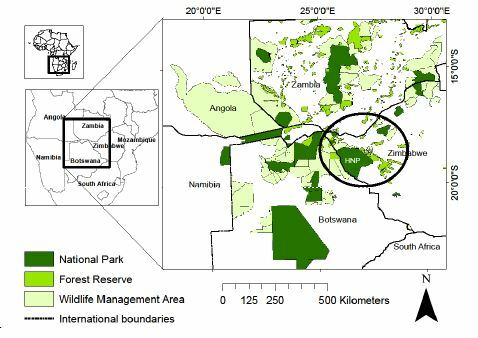 The Hwange National Park study area is indicated within the circle on the right hand map. This model (which we could create only because of the thousands of hours of expensive and labour-intensive fieldwork) allows us to predict the relative ease with which a lion can move through the landscape. Areas of ‘low’ resistance are relatively easy for a lion to move through, while those of ‘high’ resistance (usually because of difficult terrain or adverse human activity) are more difficult for lions to traverse. The map in Figure 2 shows where we predict corridors for lions will be, and now we are busy checking – with the help of our satellite-tracked lions – whether they actually do so in the field. Figure2.2: Resistance landscape for dispersing lions. Cells (pixels) coloured in yellow and orange shades represent low resistance (i.e. areas lions are easily able to move through. Red, pink, purple and blue shades represent areas lions are likely to find increasingly difficult to traverse (work by Elliot, Cushman, Macdonald and Loveridge). Another general problem in conservation, and specifically for the lions of the KAZA, is how to travel from their starting point in one protected area to a safe destination in another. Using a technique with the daunting name of ‘factorial least cost path networks’ we have modelled this too. Some results suggest we are on the right track insofar as a comparison of the pathways predicted by the model (Figure 3) and actual lion movement paths revealed by our satellite-tracked lions (Figure 4) show some remarkable similarities. Figure 3. Model of predicted movement of dispersing lions in the KAZA landscape. a) Protected areas within KAZA, ‘source points’ used in the model are indicated by white dots. b) the predicted movement paths of dispersing male lions. The colour ramp indicates corridor intensity, measured by the number of least cost paths among combinations of source points passing through a given pixel, and ranges from 0 (black) to 197 (dark red), (work by Elliot, Cushman, Macdonald, Loveridge). Figure 4. 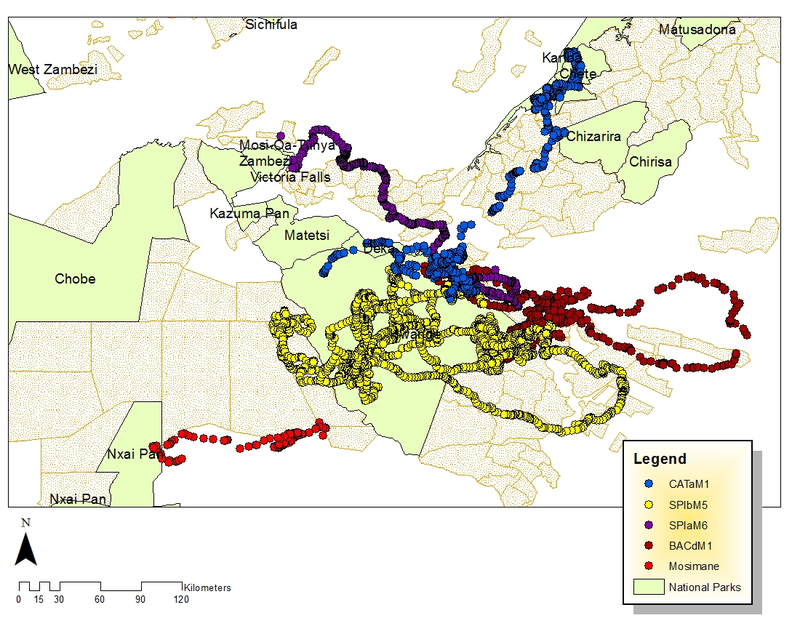 Map of long range movements of GPS collared male lions in the region surrounding Hwange NP between 2009 and 2013. All but SPIaM6 were sub-adult dispersers. These movements suggest that, in accordance with predicted landscape connectivity models, habitat corridors exist to the North and West, but not the East of HNP. Lions dispersing East (SPIbM5 and BACdM1) returned to the protected area complex after an exploratory dispersal movement through human dominated agricultural areas.